Information » Behavior & Personality » My Hedgehog Hates Me! Your hedgehog is uncomfortable due to quilling. By understanding your hedgehog’s behavior you can handle your hedgehog in ways that make your hedgehog more comfortable. Your hedgehog needs to be comfortable before it can relax. Hedgehogs are nocturnal creatures this means that they typically sleep during daylight hours and are active at night. Therefore, we need to wake up our hedgehogs in order to play with them. Some hedgehogs wake up in a great mood while others need some time. 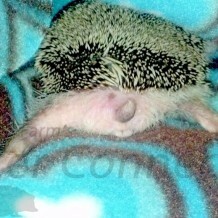 Hedgehogs, like humans with “bed-head”, need some time without a lot of stimulation, such as touch. Touching a hedgehog with “bed-head” increases the hedgehog’s irritation thus causing it to huff and puff more instead of relaxing. The best ways to wake up a hedgehog with “bed-head” is to simply hold it in flat hands or sit it down on a pillow or other soft place and allow it to become active on its own. See the article, Waking Up Your Hedgehog for more information about this topic. Many times hedgehogs that are simply shy or scared are misdiagnosed as grumpy. Keep in mind that hedgehogs are naturally fearful animals that are basically defenseless against danger. When hedgehogs go to new homes they are likely to be naturally scared of both you and its new surroundings. Older hedgehogs that have not been properly handled by previous owners or socialized may be especially fearful of new people. A hedgehog’s only line of defense is to ball up, huff and puff, and use its spines for protection. A hedgehog that senses something “different,” i.e. a noise or movement, automatically reacts defensively until it feels safe enough to come out of its ball to investigate. When you pick up your hedgehog its natural instinct is to assume that danger might be lurking nearby, so it balls up for protection. Hedgehogs that are afraid do not want to be touched. After all, who wants to be touched by something that might cause harm? For this reason, holding your hedgehog close and touching or petting it to soothe it as you would to calm a puppy or kitten, will in fact make your hedgehog more afraid. Holding your hedgehog in flat hands out away from your body is the fastest and simplest way for your hedgehog to relax. Change in behavior is perfectly normal and should be expected considering the potential discomfort of the quilling process. You don’t want to avoid handling your pet during the quilling process, but you certainly don’t want to increase their agitation by petting it if its behavior indicates it is uncomfortable. Allowing your hedgehog to move about and investigate its surroundings without being “petted” will still be positive bonding time for you and your hedgehog without causing it discomfort. Don’t worry though, with consistent and considerate handling, the grouchiness will get better. For more information on this topic see the article Quill Loss and Quilling. You will need to build trust with your hedgehog and teach it that you are safe. You will also need to get to know your hedgehog and how your hedgehog prefers to be handled, and then respond appropriately. Should your hedgehog seem sensitive to bright lights, handle your hedgehog in the evening in the light of a computer monitor, T.V. or a dimly lit room. Don’t pet your hedgehog if it puts its quills up or seems to be upset when touched. Even though your hedgehog might act defensively, it is important to keep handling your hedgehog. Don’t wait for your hedgehog to seek you out for attention and to gain confidence on its own, instead provide opportunities to trust you. If you avoid handling your hedgehog because it is acting defensively, you are only rewarding its negative behavior. Finally, and most importantly, don’t give up! Thanks for the article. I just have a couple more questions. Because I’m a new owner and very naive…I have read your articles on your website and they are extremely helpful. BUT…your articles state to scoop it up with flat hands to pick him up when first woke up. Currently I am scooping him up in his sleeping bag. Does this harm the bonding process or impede it in any way. What about when I roll him out of the sleeping bag onto the pillows?? Even though I am extremely gentle and cautious…I still feel like I am hurting him. I know I’m not making him too happy because he is huffy and puffy at me. Your article states to pick him up with flat hands but at the bottom of the article you say about petting and it may take the hedgie longer if he is upset and doesn’t want to be touched to uncurl and calm down than if we don’t touch him. You said to be very deliberate in movement when picking up a sleeping hedgie or a grouchy one. Let me tell ya…the little huffing and puffing and hissing really intimidates. Am I to not back off when he does this and just…I guess go forth and conquer?? For a little thing it is very unnerving and I want to make sure I am doing it correctly and not hurting him but at the same time I don’t want to be afraid to pick up my hedgie. We had such a better day yesterday with Napier! It was great. I picked him up in his sleeping bag and walked him around the house with me as I was doing odd little things…I talked to him the entire time. When I placed him on the pillows and rolled him out of his sleeping bag he was ready to go and explore in a matter of seconds. Much more friendly…and whenever he would get tense or nervous over a small noise or movement I would put my hand in front of him so he could smell my scent and talk to him…this seemed to relax him much faster than if we let him come out on his own. We do not grab at him or try to “force him”…the kids and I just put our hands/forearms down on the pillows and Napier sniffs around and then crawls all over us. This way it’s more of a natural thing when he crawls into our hand and when we do pick him up. He is used to crawling on us and it just seems a natural thing to do. The only time he balled up when we were playing with him was when he had to go to the bathroom. I’ve noticed this behavior twice…. so next time I know…when he stops playing and just hunches down it’s time to put him back in his cage so he can have a potty break.